The 2019 Spring semester is underway, but before we (both students and faculty) get completely sucked into our courses we’re going to finish our 2019 Rock Music Oman program with a symposium and celebration on Wednesday, January 30th from 6 to 8 p.m. in McGlothlin-Street Hall 219. Everybody is invited as the event is open to the public. If you are in Williamsburg, come join us. Here is a quick recap of our 2019 program. 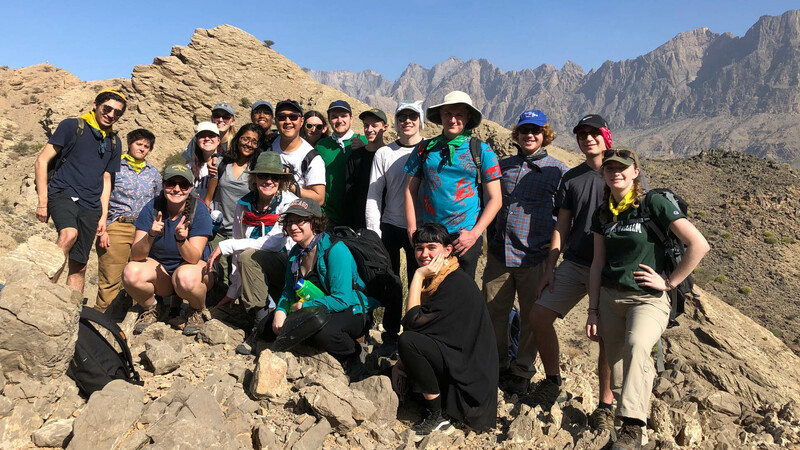 We spent four adventurous days in the Muscat area (the first two days are chronicled here) before setting out on an 8-day excursion across northern Oman. 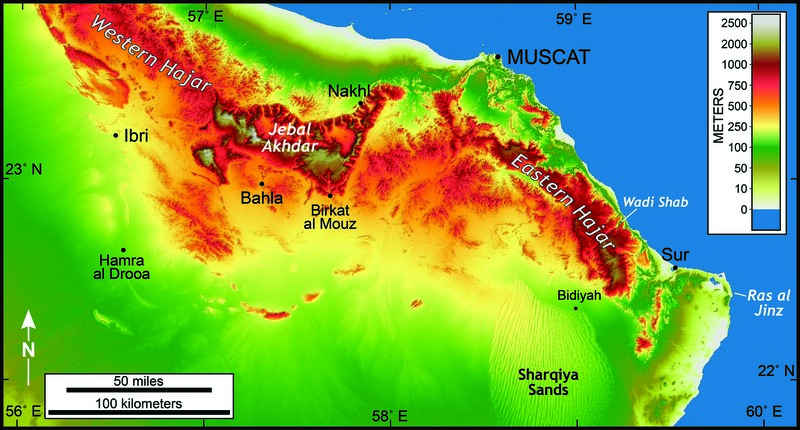 We followed a counter-clockwise route from Muscat, skirting across the northern edge of Jebal Akhdar to Ibri. 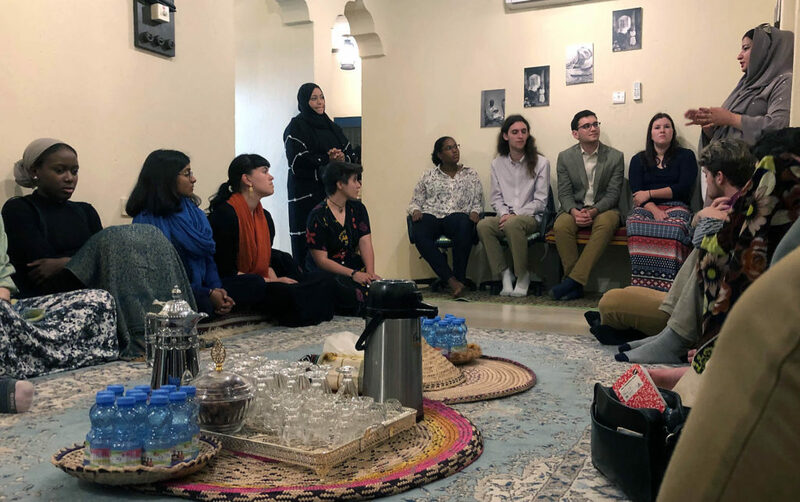 The Noor Majan Institute in Ibri served as our base for three busy days, during which we rode camels near Hamra al Drooa, dined with a sheikh, toured the massive fort at Bahla, and hiked to ancient beehive tombs at Al Ayn. 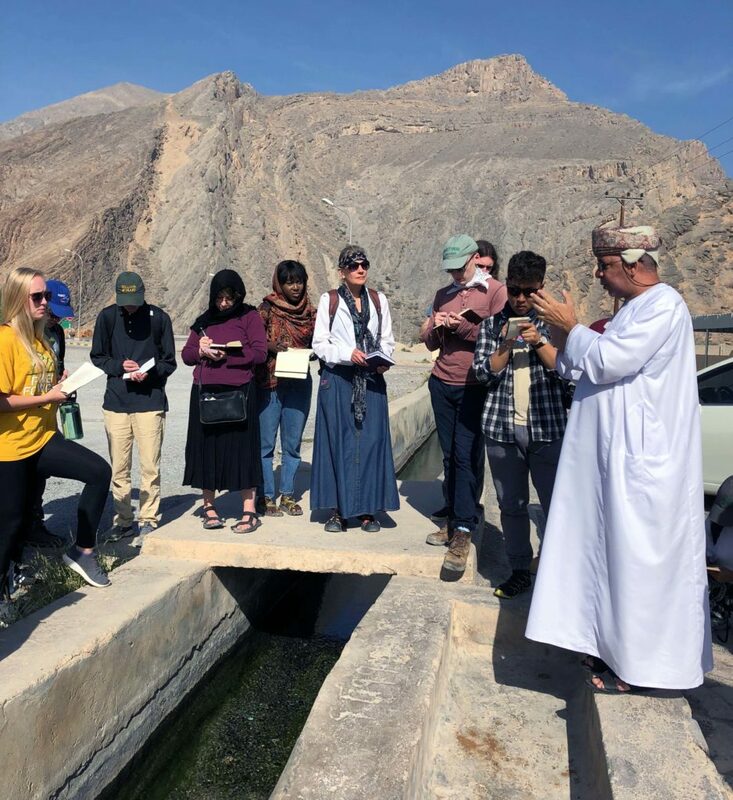 From Ibri we journeyed east to Birkat al Mouz for an aflaj tour with our good friend Dr. Abudullah al-Ghafri, a professor at the University of Nizwa. 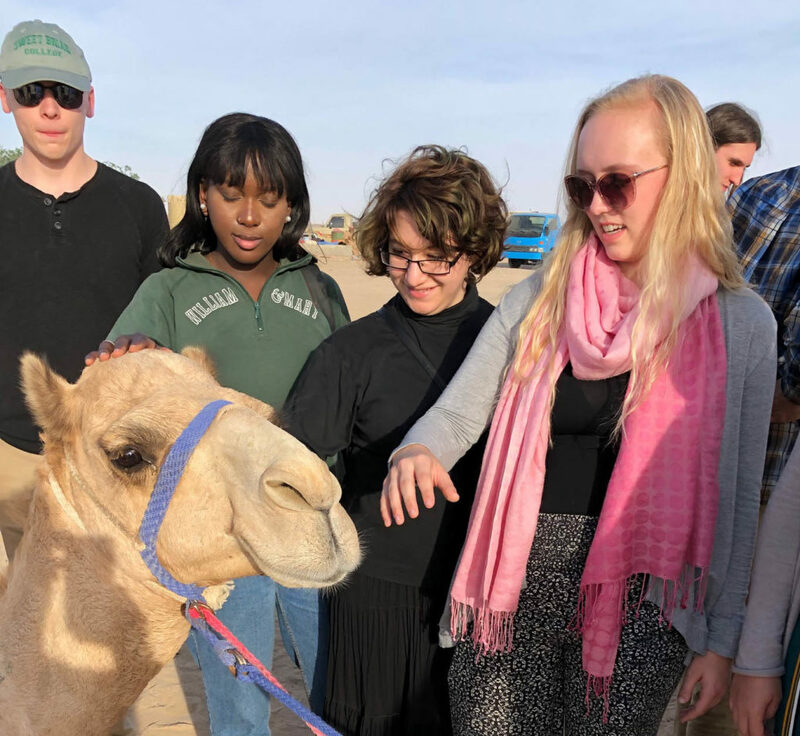 As noted in my last post, our time in the Sharqiya Sands was both relaxing and educational. At Ras al Jinz, Arabia’s easternmost point, we watched sea turtles lay their eggs under an inky black sky. En-route to Sur, we visited the ‘Mother of All Outcrops’ and then toured the traditional dhow boatyard. We journeyed into Wadi Shab for a hike and a swim in its welcoming waters. On our return to Muscat we had the good fortune to spend an evening at the Muscat Festival, and rounded out our program with visit to Mutrah’s iconic souq. Shaded relief map of northern Oman (click on the image for a much bigger view). 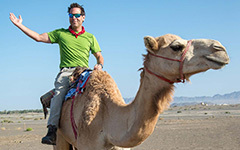 Oman is an awesome destination. 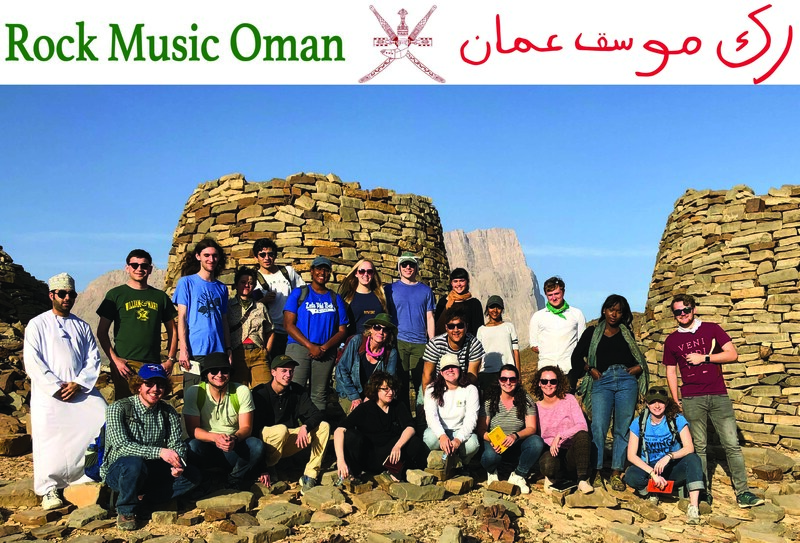 For students who want an authentic COLL 300 experience consider joining us for the next edition of Rock Music Oman. Here’s a selection of photos that highlight the last week of the program. Dinner with the Sidab Women’s Group on the outskirts of Muscat. 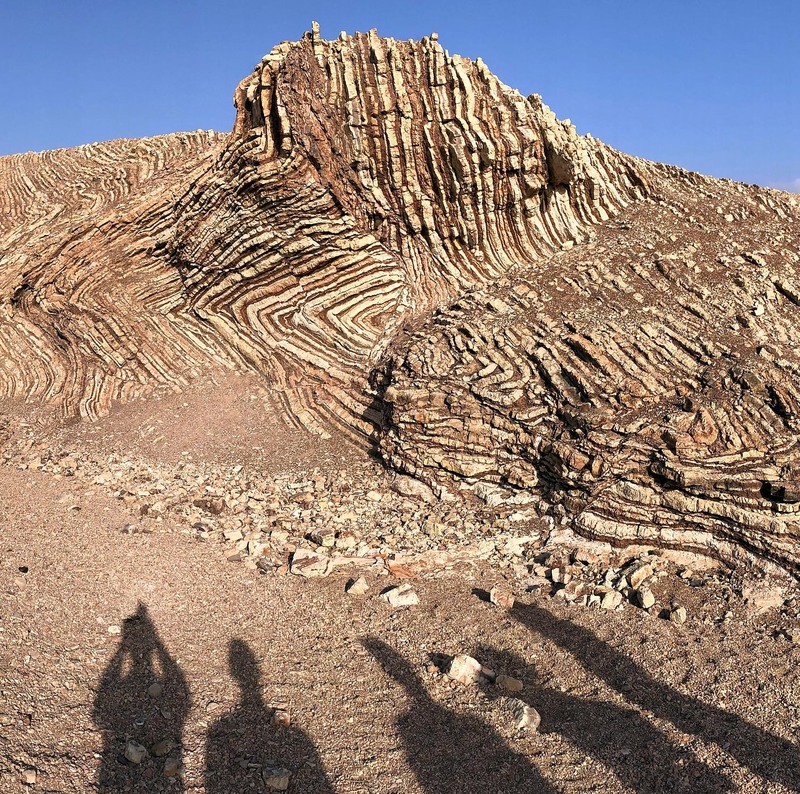 On an outcrop in the Ghubrah Bowl, Jebal Akhdar. 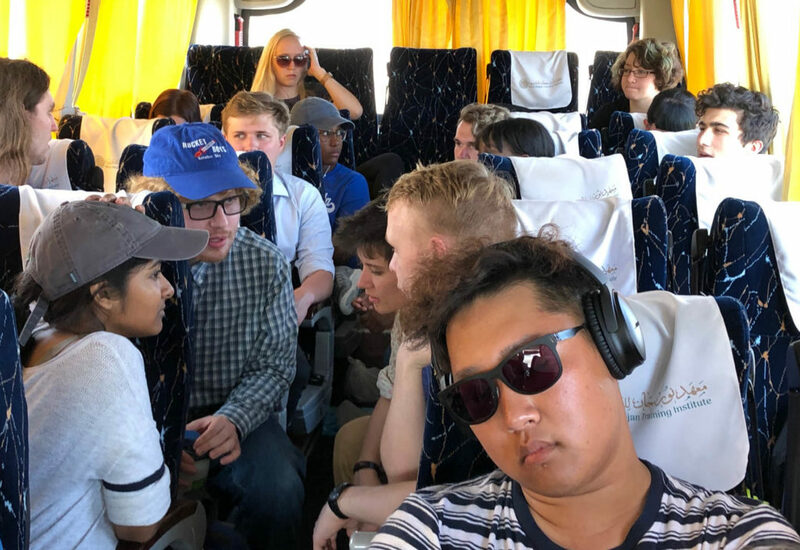 Busy times in the back of the bus. 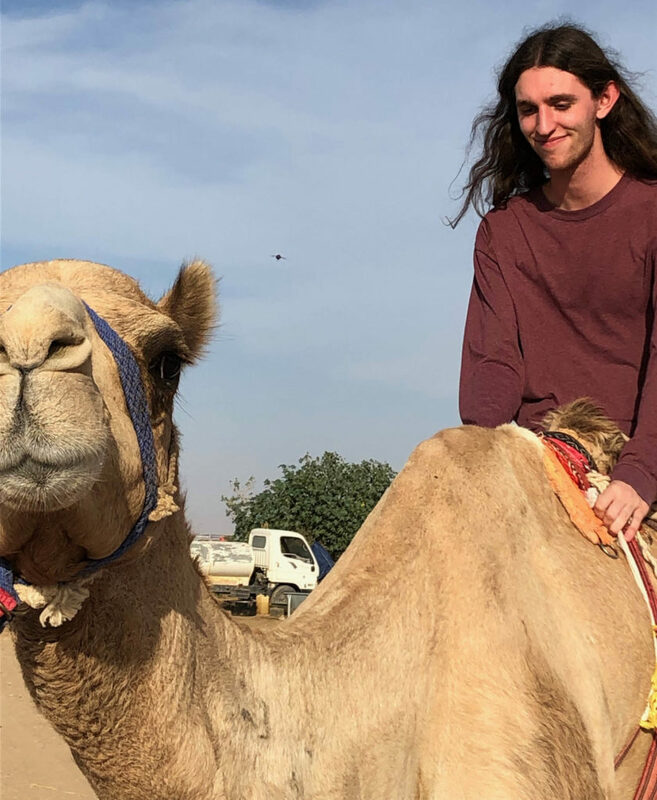 A prize-winning camel with their adoring fans. Finn Mayhew goes for a ride with his new best friend. Dr. Anne Rasmussen playing in the band. Note our commodious bus in the background and the poster of Sultan Qaboos. 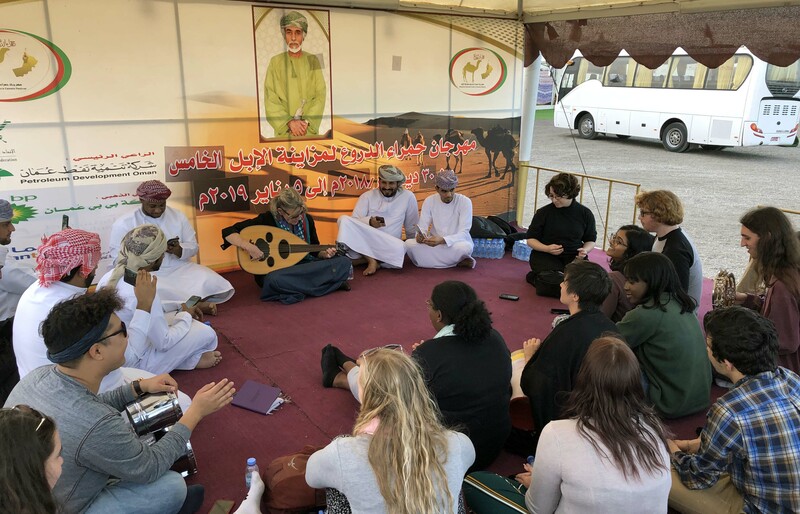 Dr. Abdullah discusses the falaj at Birkat al Mouz. 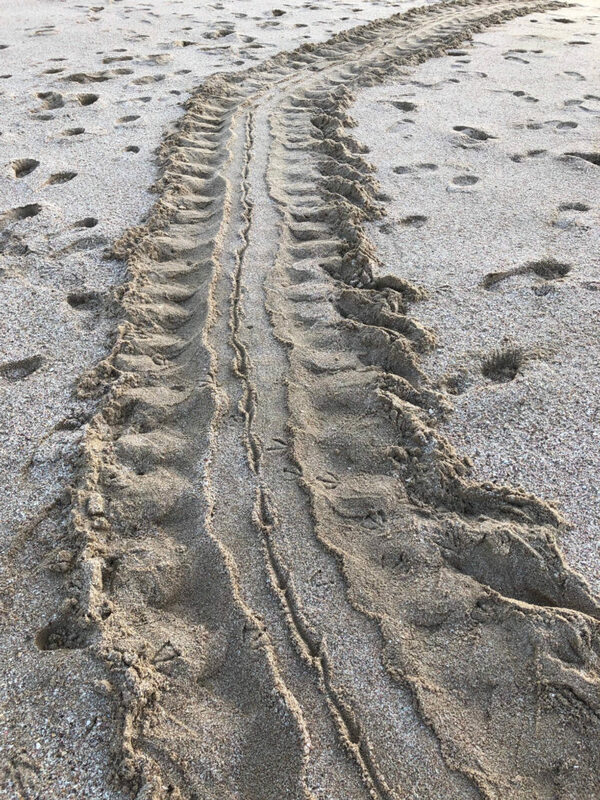 Turtle tracks on the beach at Ras al Jinz. Shadow people examine the ‘Mother of All Outcrops’ in the bright morning light. 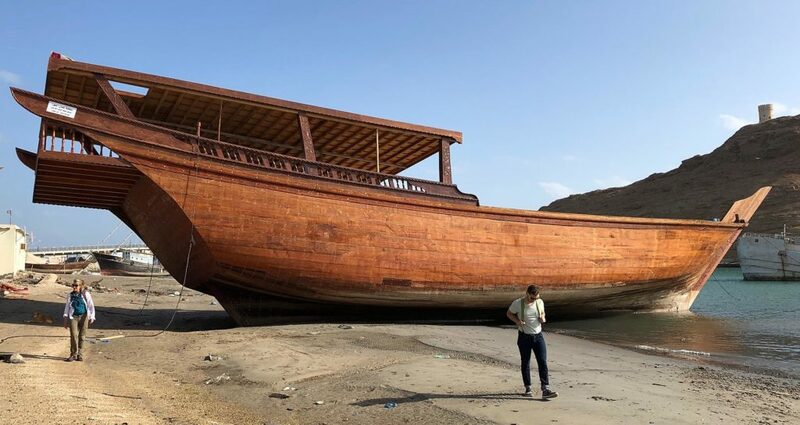 A newly crafted dhow beached at Sur. 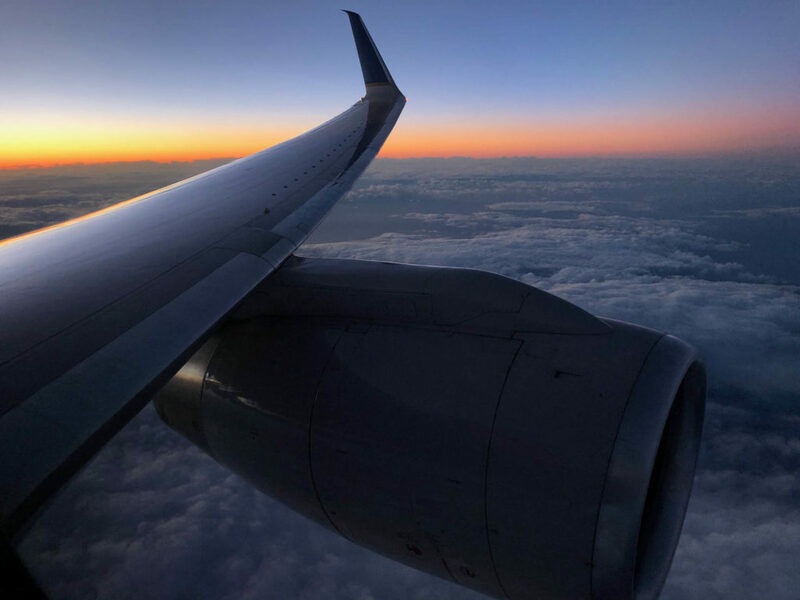 Winging our way home to a new semester at William & Mary.